Lonely Planet's pocket-sized bestseller is back, packed with great ideas, insider advice, tricks and trade secrets to help you win at travel, from scoring that elusive upgrade to staying safe on the road. We've spoken to dozens of seriously clued-up travel gurus including industry experts, travel writers and Lonely Planet staff, so we can pass on their advice to you, wherever you're heading, whatever your budget. 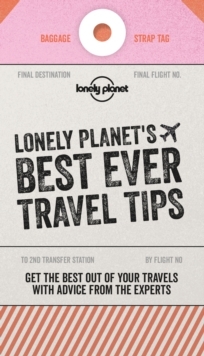 Fully revised and updated, Lonely Planet's Best Ever Travel Tips is here to help you have a better, safer and cheaper trip. You'll find tips on everything from booking flights and hotels to nutrition and responsible travel - all brought to life with colourful illustrations. Now features sections on tech, mindfulness, social accommodation, ethical travel and lots more. Travel tips include:How to travel lightLearn the art of bundle wrappingThe truth about flight upgradesTricks for online hotel bookingVegan and gluten-free travelHow to beat jet lagOn the road remediesFitness hacks for travellersHaggle like a masterWorld tipping chartTravelling plastic-freeCurb your fear of flyingAvoiding theft and scamsHow to travel responsiblyAbout Lonely Planet: Lonely Planet is a leading travel media company and the world's number one travel guidebook brand, providing both inspiring and trustworthy information for every kind of traveller since 1973.